One of the days while we were in California we took the opportunity to visit Joshua Tree National Park. We didn’t arrive at the park visitor center until mid-afternoon, and by the time all 6 kids had made a bathroom stop and Miss Kicky Feet was changed, it was approaching evening as we headed into the actual park. We found a trail that interested us and off we went. We were not on the trail very long when the kids were again off the trail and scaling the rocks and boulders that are common in the park. This sort of thing is not frowned upon, if not encouraged, so we too took to climbing after them and enjoying acting like mountaineers. We eventually returned to the trail for a bit before climbing more rocks. This did, however, significantly slow our progress along the trail so a 1.1 mile loop trail took us over 2 hours to complete. By this time we were quickly approaching sunset. 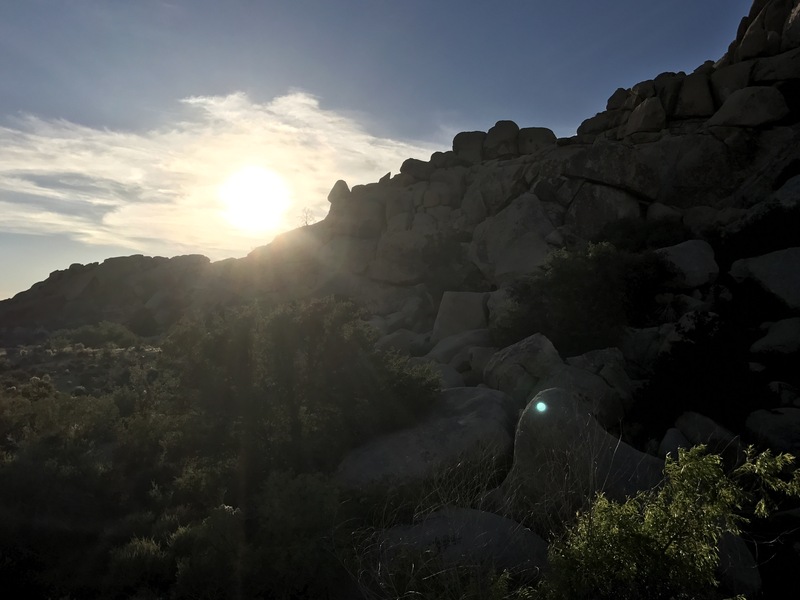 We had originally planned to watch the sunset from another trail-head in the park, but with 10 minutes left before official sunset, we knew we would never make it in time. We instead drove through the park enjoying the sights along the way. When we reached the next trail-head the sun had set, but we had a decent glow still on the horizon. We took the time to eat dinner from our cooler at a randomly chosen campsite picnic table before loading up under the bright moon (now well after dark) and driving back to the campground (outside Joshua Tree) at which the RV was parked. Bug did not even make it out of the park before I heard his long even breaths and found him completely asleep in the back seat. While we did enjoy ourselves in the park, I was glad we had our National Parks Pass and did not need to pay the admission fee of $25 for our vehicle. If we had not had our pass I would have wanted to start earlier in the day and hike more of the trails to make it worth the money. 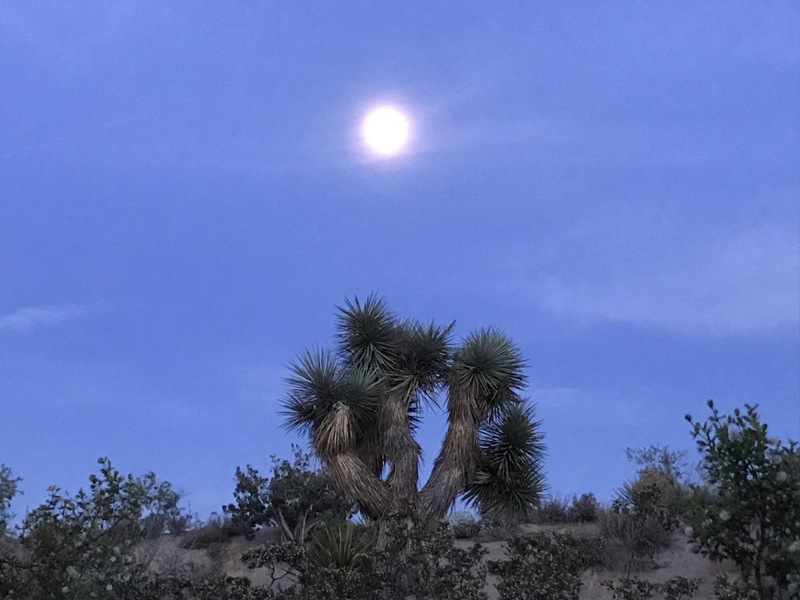 For those of you not familiar with Joshua Trees, they are actually not trees in the traditional sense of the word, but rather large Yucca plants that resemble a small tree is shape and size. 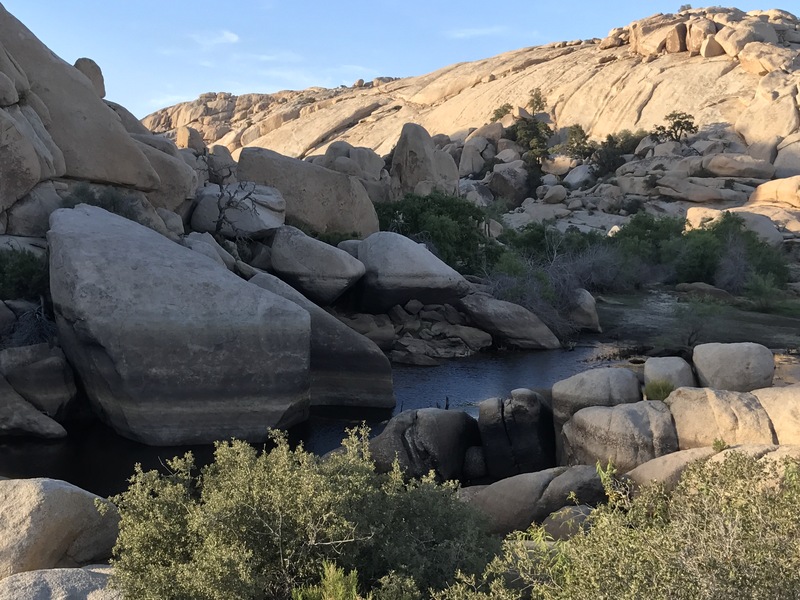 They were named Joshua Trees by Mormon settlers who thought the upward reaching branches resembled Joshua, a Biblical man, reaching for the sky in prayer. Heather found it neat that the park visitor center sold Joshua tree seeds. 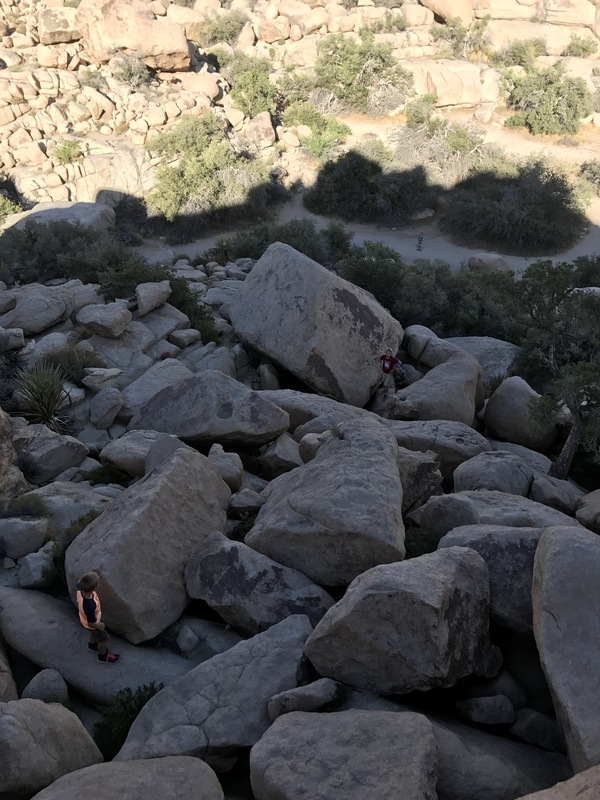 A side note from Heather: Climbing lots and lots of boulders with a baby strapped to your chest is a great (or terrible depending on your perspective) thigh workout. Yep, I was sore for days and days. Need to do this again.